Mono-ortho PCBs are global contaminants of wildlife with the potential to produce toxicity by an aryl hydrocarbon receptor (AhR)–mediated mechanism. 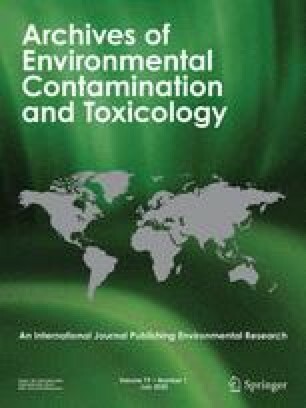 To determine the potency of 2,3,3′,4,4′-pentachlorobiphenyl (PCB 105) for producing reproductive and developmental toxicity, adult ring-necked pheasant hens (Phasianus colchicus) were orally dosed with 0, 0.06, 0.6, or 6 mg PCB 105/kg hen/week for 10 weeks to achieve cumulative doses of 0, 0.6, 6, or 60 mg PCB 105/kg hen after which hens were bred with untreated roosters once per week for 8 weeks. Except at week 6 of the egg-laying period when cumulative egg production in the 6 mg PCB 105/kg hen group was greater than controls, fertilized egg production was not significantly different between treatment groups. Embryo mortality and chick mortality were not significantly different between treatment groups. Total body and heart weights of all chicks 1 day posthatch (dph) were not different between groups, however, liver weights of chicks from the 60 mg/kg treatment group were greater than controls at 1 dph. The first chick to hatch from each hen was reared to 21 dph and among these birds, the total body, liver, and heart weights were not different between groups. There were no dose-related malformations of the beak or limbs, and no signs of subcutaneous edema, ascites, or pericardial edema in chicks at 1 or 21 dph. Hepatic microsomal monooxygenase activities [ethoxyresorufin-O-dealkylase (EROD), benzyloxyresorufin-O-dealkylase (BROD), and methyloxyresorufin-O-dealkylase (MROD)] were significantly elevated in chicks at 1 dph from hens given a cumulative PCB 105 dose of 6 mg/kg and in chicks at 21 dph from hens given a cumulative PCB dose of 60 mg/kg. These results indicate that a cumulative PCB 105 dose up to 60 mg/kg hen does not decrease the production of fertilized eggs or increase embryo or chick mortality in ring-necked pheasants, but does increase chick hepatic monooxygenase activity.